MRI (Magnetic Resonance Imaging) scans are needed for patients with a medical condition that is not easily detected through a more conventional physical exam. MRIs are used to get clearer pictures of soft tissue injuries, the brain, ruptured discs in the neck and back, tears in ligaments and joint injuries. A MRI machine can non-invasively scan head, neck, TMJ, spine, abdomen, pelvis, joints, blood vessels and musculoskeletal regions of the body. Getting a magnetic resonance imaging test can be a stressful hospital experience for many patients. Patients are scanned with a large magnet to produce detailed images of the body’s soft tissues, but the loud noises produced by the machine and its tight confines can make patients anxious about the experience. 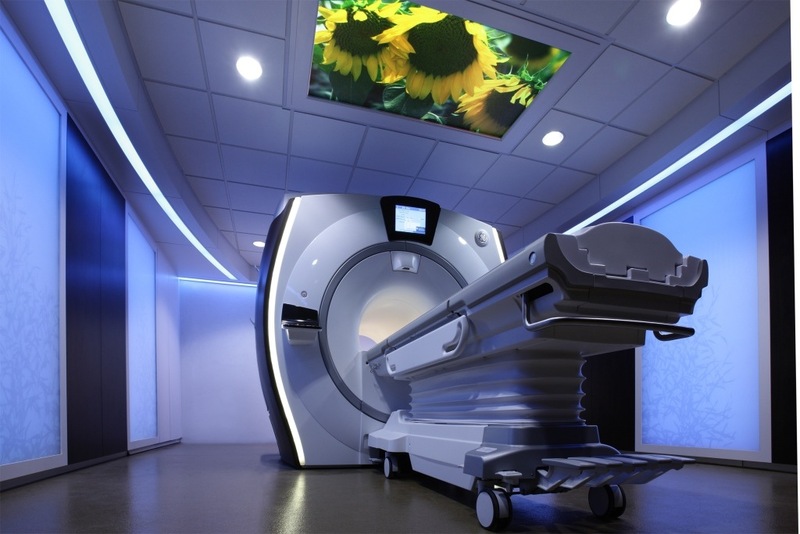 An MRI environment built just for you, which includes calming sights and comforting sounds. Ochsner St. Anne Hospital uses the Wide Bore MRI with Caring Suite technology. This technology, which is the first of its kind in the region and one of only a few in the world, offers a more comfortable, less clinical environment for patients needing an MRI. The MRI features a larger and more open tunnel that patients lie in to receive their MRI scan. It also includes Caring Suite technology, which is a unique software package that is customizable to the patient and uses images, sounds and lights to create a more relaxing and soothing atmosphere. Images themes that are available include: snowcapped mountains, a bubbling stream with water gurgling, the birds singing and fish splashing. This machine will make it easier for patients of all sizes and types to have testing performed, including those with claustrophobia by making them more comfortable during the scan. “This is the future of MRI technology right here in our area,” says Jenny LeBoeuf, MD, Ochsner St. Anne Hospital’s MRI fellowship-trained radiologist and the only MRI fellowship-trained radiologist in the region. “This method of fostering a calming environment in the midst of a clinical procedure room is truly revolutionary and will benefit our local patients tremendously.” LeBoeuf says.